Home Fest is a 2D social simulation game by Atommica that’s all about partying. Similar to Booyah’s Nightclub City players are in charge of throwing a massive house party with a live DJ set up. Decorate your house with various furniture, décor, and entertaining attractions to keep guests rolling in. Players are completely in control of this home based fiesta. Choose your favorite genre of music. Play the latest tracks from top artists. Refill drinks, dance, and cater to party goers. Complete challenging theme based missions for special rare items. Visit friends’ cribs and help clean up. Earn the reputation of throwing the hottest parties in town in this funky virtual world. Players begin with a small empty house and a DJ booth. The main objective of the game is to create the coolest party possible. Users have to attract large crowds by decorating, adding attractions, and tending to guests. The more decorations the more guests will stop by. Add different types of furniture, tables, and little touches to make the place appealing. A rather unique feature in the game is the attractions. There’s a variety of venues that players can add to their bash to make money. Set up bars, fighting rings, basketball courts, VIP sections, Houdini, a puppet show, ping pong, or a mentalist to impress guests. As party goers dance the night away they may request a dance or drink refill. Tending to their needs and tidying up when the place gets messy earns XP along with cash. Occasionally things can go wrong. Equipment malfunctions, fires, and even storm clouds sometimes appear disrupting the festivities. A quick click usually does the job. Each action requires energy to execute. The energy replenishing system is somewhat unbalanced. Unless a player is willing to spend Facebook credits on energy they have to wait until the bar is recharged. The down time can seem like forever especially when the bar is on fire. Players have to look away or watch it burn. Fortunately most the mishaps in the game are only temporary but they do reduce income. So, addressing these issues when they appear can be beneficial. Home Fest also has missions. These quests turn players into official party planners. Each mission revolves around hosting a theme based bash. Although the implemented mission option is a nice change most of the tasks are similar. Players must buy so many decorations in that particular theme, set up a special attraction, and collect a rare item from friends. The majority of quests require neighbor participation to complete which can be challenging if you don’t have that many active friends playing. The game features a streamlined interface and simple controls. When decorating or rearranging furniture players click and drag to place their desired item. An icon appears to allow users to rotate objects. Lounge chairs, tables, bars, televisions, speakers, plants, dividers, led walls, Oswald Trash, balloons, darts, coffee maker, fans, and time machine can easily be positioned or removed. Clicking on floating bubbles above guests’ heads or on random problems like electrical meltdowns instantly fixes them. A simple click on money icons hovering near attractions collects daily cash bonuses. Icons on the side of the screen allow users to leave friends notes after partying at their house. The graphics are quite impressive. When visiting neighbors the screen slides to their house. It’s an unusual but cool feature rarely seen in social games like this. There’s also a bunch of ridiculously funny mishaps that friends’ parties need assistance in such as a smelly dog or dragon monster attack. The bright animations bring the virtual world of Home Fest alive. Venues are interactive. Players can watch the Sushi chef prepare his delicacies or guest dance the night away. The character customization is also nicely done. Players have the ability to choose their avatar’s skin complexion, facial features, hair styles, clothing, and accessories. The music soundtrack in Home Fest consists of song snipes of current and sometimes older mainstream hits. Players click to check which genre of random tracks to play. Options include pop, r&b, rock, reggaeton, and dance. There are no restrictions on the number of genres activated. Users can host a bash with only rock or with all of the different types of music. Popular artists like Britney Spears, Ciara, The Strokes, Faithless, Daddy Yankee, Usher, Young Jeezy, and Justin Timberlake are part of the playlist. Players have the option of buying any of the available mp3 songs in the game. The music sounds great but it doesn’t possess the more cohesive soundtrack other similar titles have. There’s no lack of sound in upbeat simulation. Users can hear chimes when collecting and authentic thunder effects when storm clouds hover over the DJ booth. This game has a lot to offer. Players enter a musical world where strange exciting things happen. Host various theme parties from prehistoric to carnival. Decorate your home with an assortment of patterned tiles and furnishings. Assist guests with drinks and funky dance moves. 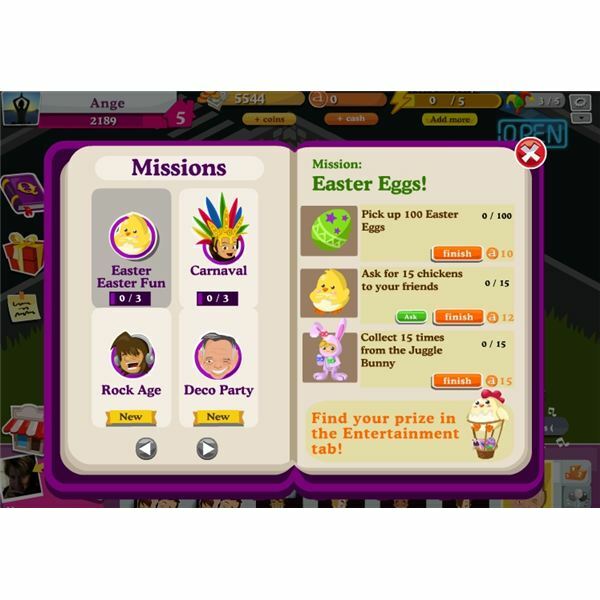 Dress up, clean up, complete challenging missions, add attractions, and keep the tunes going. Save friends from troublesome dragons, put out fires, and calm storms in order to prolong the bash. The strange combination of cool attractions, music, quests, and wacky events unfolding make this a thoroughly entertaining game. Although the track lists could be better music lovers will still have fun. Any fans of Nightclub City should definitely boogie down to Home Fest. A collection of articles to help guide you through Home Fest for Facebook.